Originally I thought I would do some red and green colour combination for today's post, it is a classic and Christmas is coming up. But then I did some research on colour theory and complementary colours, and I discovered thanks to the Wikipedia page that the combinations listed above are the traditional RYB colour model of complementary colour theory. However, according to modern colour theory, a complementary colour should produce a grey-scale colour like white or black when combined, and create the strongest contrast when next to each other. The colour pairings in the traditional system do not fit this definition, as they produce brown when mixed. According the modern colour theory, the complementary pairs are red–cyan, green–magenta, and blue–yellow. Wow, the things you learn for MoFo! Anyway, this worked great for me as I had recently seen a lovely yellow cornmeal and blue blueberry dish in Color Me Vegan, which fit the bill perfectly! Cornmeal Blueberry Porridge (Sautauthig) is a dish that originated with Native Americans. 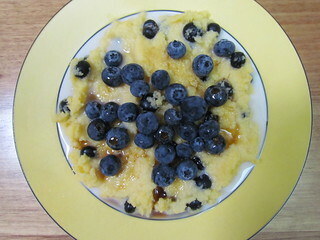 In a more modern form, it is a polenta porridge (cooked with oat milk and water), sweetened with maple syrup, and then with blueberries mixed through. I made a third of the recipe (which said it serves 6-8 in full form), and I had one very filling breakfast! What is your favourite colour pairing? Sahara loves to sleep everywhere. No bed or chair is safe from her attention. She particularly likes to have as much underneath her as possible, so if I leave anything lying on the bed (like my PJs), she will definitely choose that spot to sleep! Oh, I love polenta! I really should start cooking with it more. Thanks for the inspo. I hadn't thought much about colour theory until now, it was a pretty fascinating read. Wow! I'm impressed by how much work you're putting into Mofo! Haha. I wouldn't have even bothered to research all of that.. ;-) But now I've learned something too. Btw, when I briefly decided to follow the prompts, I got super nervous when I saw the color week. Haha. It sounded way too hard! I thought colour week would be easy, until I started doing it and then it turned out to be harder than I thought! But I discovered something new, so that's good. I still don't know what I am going to do for that prompt. I don't know much about complementary colors, which is a shame... didn't learn that in first grade? I don't know if we were taught that in school either. I don't remember. That is why I was googling them. It is blueberry season here now - they are delicious! Very interesting about complimentary colors! Your porridge looks great! :) Sahara looks so adorably sleepy hehe! She has the greatest sleepy face in the history of sleepy faces. The colour stuff is really interesting and your dish looks great! I like those two colours together. I am back from my holiday and catching up on Mofo. 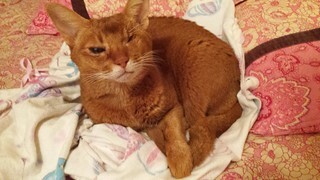 Really enjoying seeing your pics of all the cats you have lived with. The picture of you playing table football with Ma is adorable. I am loving looking through all my old photos of the cats. I hope you had a great holiday! Being my signature colour, pink goes with everything. I also think that Sahara matches my blue jeans when she lets me harass her to give scratches! I have to try this, I haven't ever had sweet polenta! Sahara goes well with any colour, though she prefers something dark so her red fur can rub off on it! I've never had sweet polenta before! Yours looks very yummy! She is so gloriously red! This is a very pretty bowl! I really like anything with blueberries.